The following post was submitted by William Skaff, NEI's director of policy analysis. Yesterday, the EPA issued a final rule implementing Section 316(b) of the Clean Water Act for existing facilities. NEI is currently reviewing the rule to determine how closely it conforms to principles of sound environmental regulation. In this post, Skaff lays out the facts about water use at power plants in relation to 316(b). Cooling towers consume twice as much water as once-through cooling systems. Climate change modeling predicts freshwater constraints across the country. Thus, consuming twice as much aquatic life habitat will not be protective of fish populations going forward. Clearly, the one-size-fits-all approach of a nationwide cooling-tower mandate is not environmentally responsible. There are 3,153 species of fish in the waters of the United States. All vary in susceptibility to mortality at the intake structure and in responsiveness to various fish-protection technologies. Each water body has a different mix of these species. Thus, a site-specific approach taking population diversity into account is most protective. 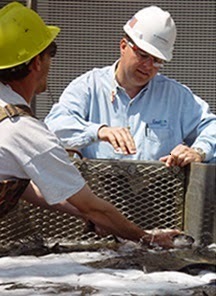 According to the EPA, most plants regulated by the 316(b) rule already have installed and are operating effective fish-protection technologies. Studies of aquatic life population abundance at power plants with once-through cooling systems indicate no adverse environmental impact at the population level in the source water body. Ongoing reproduction readily replaces the one percent of the population, on average, lost at the cooling system intake structure. A technology-based standard—such as traveling screens with a collection-return system—can accommodate site ecological diversity because it can be designed for the specific fish population of a given site. Learn more about water use and holistic environmental management from NEI's fact sheet and website. Presumed high water-use of power plants seems mere concern trolling. What's behind it is the perception that solar and wind power do not use water. While solar and wind probably do use less water than thermal plants (whether nuclear, coal or gas), water-use of power plants is not a major issue and is not particularly relevant for energy policy, in my opinion. "borrow", etc. If "consume" is defined as "water that is removed from a water source and not returned to that source with the same chemistry", cooling tower systems use infinitely more water than once-through systems because once-through systems "consume" no water; they simply "borrow" it. However, comparing the influx of water for a once-through system to that of a cooling tower system would show that a once-through system uses (or borrows) nearly one hundred times as much water as the cooling tower system does, usually returning that water to the source with the same chemistry, but at a much higher temperature than the water returned from the cooling tower. Many plants, including many US nuclear plants, could not exist as once-through plants because the amount of water available is insufficient. However, those plants can and do exist because of cooling towers. At best, the article (or at least the opening sentence) is inaccurate and misleading. Nobody mentions the evaporative losses of the cooling towers. Once through systems "borrow" water, warm it up some and return it. They also kill plant and animal life in the process. How much and how far below a sustainable mortality threshold is beyond me. Cooling towers or other type closed systems, once established would have low mortality. Look to Turkey point nuclear plant and their resident Crocodiles(that’s right, Crocodiles)living in the plant cooling canals. The big question is the amount of makeup water needed to replace evaporative losses. That is how cooling towers work, remember? This is a big number folks. From what source do we draw it? Cooling water "usage" can be a NEGATIVE concern if we deploy Liquid Fluoride Thorium Reactors. The higher exhaust temperature allows effective air cooling. It also allows for effective desalination. Energy PLUS fresh water... such a deal! Only thing there is the U.S. nuclear industry is fighting for its life and can't afford to experiment or install new reactor concepts like this. Yes, LFTR's a great idea, but throwing out all kinds of reactor schemes to an already nuclear-jaded public only fans more confusion that leads to doubt and distrust of just how safe and effective ALL nukes are. Like Hiroshima Syndrome states, best stick with tried-and-true reactor concepts to first drive you out of the mud of bad public perception then you're free to try new concepts. Just because LFTR hawks itself as safer won't mean the public will eat it since to them a nuke is a nuke is a nuke. Broadcasting the unsung merits and admirable record of current plants is the best to get the public open to future things like LFTR.